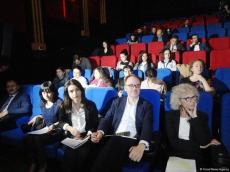 The European Film Festival now turning into annual event in Azerbaijan serves to building and developing the cultural links existing between the European Union countries and Azerbaijan. The eighth of the Festival will run in Baku on November 2-12 featuring films of different genres including melodrama, comedy, and social drama. This year the programme of festival included the screening of films from Belgium, Bulgaria, Czech Republic, Croatia, Estonia, Finland, France, Germany, Hungary, Italy, Latvia, Lithuania, the Netherlands, Poland, Portugal, Romania, Spain, Sweden, the United Kingdom, as well as Norway and Azerbaijan. A press conference timed to the film festival was held in Park Cinema on October 31. The Head of the EU Delegation to Azerbaijan, Ambassador Kestutis Jankausk took part in the event, Trend Life reported. The ambassador said that the festival will feature 21 films made by 19 EU countries, as well as Norway and Azerbaijan. "Four directors, whose films entered the festival's program, are invited to Baku. A number of meetings and discussions on their works will be organized within the festival," he added. The festival will offer the opportunity to get acquainted with the latest trends of the European film making and to discuss with European leading film directors, and guests of the Festival: Bulgaria's Dimitar Kotzev, Belgium's Kad?r Balci, Portugal's João Nicolau Teixeira Ricardo and Netherlands' Joram Lürsen. Jankauskas noted that the European Film Festival, which became a tradition in Azerbaijan, serves the development of cultural relations between EU countries and Azerbaijan. The 8th European film Festival comes weeks after the successful 1st IMAGINE Euro Tolerance Festival celebrated on October 12-20 attended by more than 3.000 people. Musa Akhundov, Sales & Marketing Director at Park Cinema said that the screenings of the films will be held in Park Cinema Metropark, Park Cinema Flame Towers and Park Cinema Park Bulvar. Films will be shown in the original language with English subtitles. All events will be open to the public and organized free of charge on "first come first served" basis. Counselor of the French Ambassador to Azerbaijan Fabien Dru-Lozinski spoke about the film "Lumière!" by French director Thierry Frémaux . The film will be screened on November 2. Azerbaijan will be represented at the festival by film director Ilgar Najaf and his movie "Pomegranate Orchard".